Today we are looking at a pair of premium sunglasses that have seen some great reviews and feedback on our site. 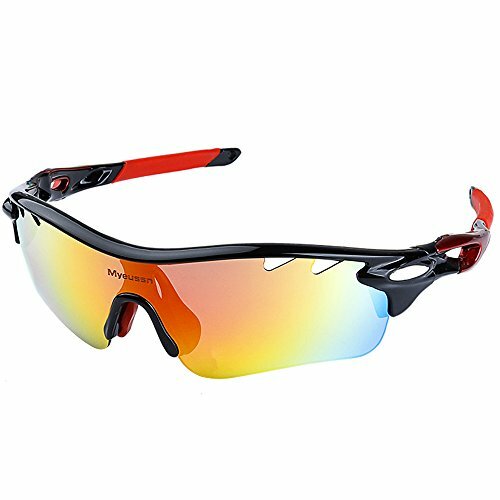 If you are looking to enjoy high-action snow sports or outdoor activities this year then these are the sunglasses for you. With a strong polycarbonate frame, these sunglasses will not easily break. This makes them perfect for throwing in your backpack or pocket in preparation for a day of adventure. The frame features a comfortable rubber nose piece and arm grips keeping them firmly secured in place through even the most extreme of outdoor activities. Protect your eyes from snow-glare and damaging UV rays thanks to the lenses inbuilt UV400 protection. Guaranteed to block 100% of harmful UVA & UVB rays. The sunglasses come with five interchangeable lenses each suited to their own activity, including, a stylish red REVO lens, a yellow tinted lens for nighttime activities, a transparent lens for low vision activities, a blue lens for daily activities, and a dark black lens for driving and sunny days. The sunglasses come with an assortment of other useful accessories including; two soft carry cases, one hard carry case, cleaning cloth, myopia frame, lanyard cable, and testing card. If you are looking for a comprehensive sunglasses pack this winter then look no further. We haven't seen a more feature packed and premium product in 2019. The sunglasses come with a 30-day satisfaction money-back guarantee so don't miss your chance to try a pair today. Coupon code applies to all the 4 colors.